"This Zucchini Basil Soup is super delicious and healthy," says Giora Shimoni. "And it is surprisingly easy to prepare. Just sauté onions, garlic and zucchini, add water and spices, simmer and purée. This parve Zucchini Soup can be served warm or cold. We like to eat it warm for Friday night dinner and cold for Sabbath lunch, as my kids like to dunk their challah into the soup." Giora's Serving Suggestions: Serve with croutons, soup nuts or fresh, crusty bread. Large zucchini are often more watery and less flavorful than smaller ones. 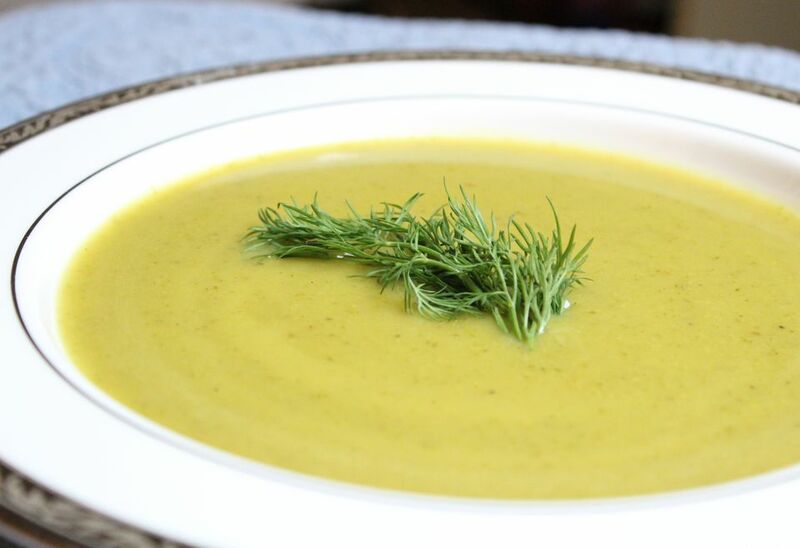 If lackluster zucchini leave you with a bland soup, season to taste with extra herbs or a favorite spice blend. Fresh dill or curry powder both work well. In a stockpot set over medium-high heat, warm the oil. Add the chopped onion and garlic, and sauté until the onion is soft and translucent, about 5 minutes. Add the chopped zucchini and sauté until slightly softened, about 3 to 5 minutes. Add the basil, 4 cups of stock, and dried parsley. Bring to a boil. Reduce the heat and simmer, partially covered, until the zucchini is tender enough to purée, about 25 to 30 minutes. Use an immersion blender to purée the soup until smooth. If the soup is too thick for your taste, thin with additional stock to desired consistency. Season to taste with sea or kosher salt, pepper, and a favorite spice blend, if desired. Ladle into bowls and garnish with fresh herbs, if desired.